Species are currently becoming extinct at up to 1000 times background rates. 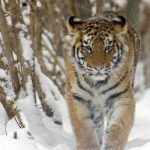 Without reliable data on the numbers and distribution of free-ranging species, we can’t hope to redress this situation. Current techniques, for example VHF and satellite collaring, provide very detailed data on just a few individuals, and are often too expensive to apply more widely. In addition they can negatively impact animal welfare and reduce data validity. FIT is a non-invasive and cost-effective approach to monitoring that can be applied everywhere that footprints are found. ConservationFIT is based on the fact that the conservation of biodiversity is everyone’s focus now. We all depend on a vibrant biodiversity for our daily lives – from the air we breathe to our water, food, medicines, and other natural resources. Learning how to live sustainably on our planet is a critical part of the education we give the next generation. They will inherit a very different Earth from the one we were born into, with huge new challenges. 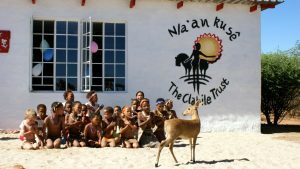 Local San children at school in Namibia have wildlife right at their classroom! For these adults of the future, conservation is part of everyday life. 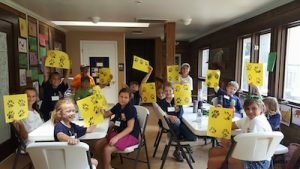 The general concepts of conservation are a natural point of engagement for even very young children, who through this medium learn about human impacts on the environment, and the need to share space with the animals they all love. As they become older and learn more about the applications of technology to conservation, we engage them in STEM solutions to the challenges in conservation. They can collect footprint images, learn how to fly drones, engage in robotics solutions. 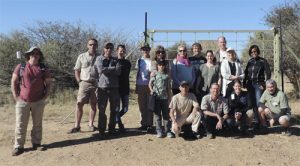 WildTrack’s 2nd International Cheetah Workshop, Namibia. At the University level we partner with students on every continent to drive technology forward. Current challenges include deep learning applications and drone technology. Education doesn’t stop there! ConservationFIT is specifically designed to engage Adults as learners, to collect data from us wherever they go, simply using smartphones or drones. ConservationFIT partners will run workshops that teach communities how to engage with this project, and how to use FIT for monitoring.